Statistics Canada released December’s inflation report this morning to round out the data for 2015. The Consumer Price Index (CPI) posted an annual increase of 1.6%, narrowly below expectations. Analysts had forecast an annual inflation rate of 1.7% for December. For the year ending in November, annual inflation was 1.4%. While inflation remains stubbornly below the Bank of Canada’s target rate of 2%, annual numbers appear to be trending higher and the Bank of Canada expects inflation to be close to their target by early 2017. Excluding the impact of falling gas prices, Canada’s inflation rate is trending close to its target rate. Excluding gasoline, the CPI was up 1.9% in both November and December. The gasoline index fell 4.8% year-over-year in December and accounts for 3.8% of the total price index. Prior to seasonal adjustments, overall prices slipped 0.5% in December, marginally below the consensus forecast of a 0.4% monthly decline. Non-seasonally adjusted prices fell 0.1% in November. In December, prices were lower in every provence and in six of the eight major components of the CPI. Food prices climbed 0.6% and shelter costs were up 0.1%. At 2%, December’s core annual inflation rate was slightly below the market’s expectation, which was 2.1%. November’s annual core rate was also 2%. Seasonally adjusted monthly inflation was 0.1% in December compared to 0.2% in November. Consumer prices were higher in four of the eight components of the CPI. The seasonally adjusted food index was the main driver of December’s inflation, increasing 0.6% for the month. Food accounts for 16.4% of the total index. Shelter costs are the largest component of Canada’s CPI, representing 26.8% of the index. Shelter costs have generally been trending higher for over a year. In December, the shelter index climbed 0.1%, matching November’s rate and following a seasonally adjusted spike of 0.3% in October. The index for clothing and footwear posted the largest monthly decline, falling 0.9% in December with seasonal adjustments. The indexes for health and personal care, and alcohol and tobacco were both lower in December compared to November. The index for recreation, education and reading was flat. Canada’s CPI climbed 1.6% in 2015, compared to 1.4% for the year ending in November. Rising food prices had the largest impact on overall price levels, climbing 3.7% over the year. This includes increases of 4.1% for food purchased from stores and 2.8% for food purchased from restaurants. The transportation index recorded it’s first annual increase of 2015 in December. Although gasoline prices fell 4.8% for the year, the year-over-year decline for November was 10.6%. In December of 2014, Canada’s CPI slipped significantly, down 0.7% for the month. Because this number is no longer included in the calculation of annual inflation rates, the annual rates were higher in December versus November despite sliding prices for the month. Prices slipped in every provence in the month of December. Large declines were recorded in the oil dependent economies of Alberta and Saskatchewan, down 0.8% and 0.9% respectively. Manitoba also saw prices decline 1% in December. For the year ending in December, British Columbia had the highest inflation, with prices climbing 1.9%. Saskatchewan and Ontario were close behind at 1.8% and 1.7% respectively. 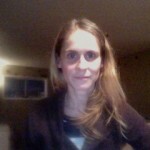 Higher electricity prices introduced in Ontario in November drove price levels up in that provence. PEI posted the lowest annual inflation rate at only 0.9%, which is significantly higher than the annual numbers that PEI posted earlier in the year. In November, PEI’s price index recorded it’s first positive annual rate of inflation in 12 months. The Bank of Canada’s January 2016 Monetary Policy Report explains their decision to maintain their target for the overnight rate at 0.5%. 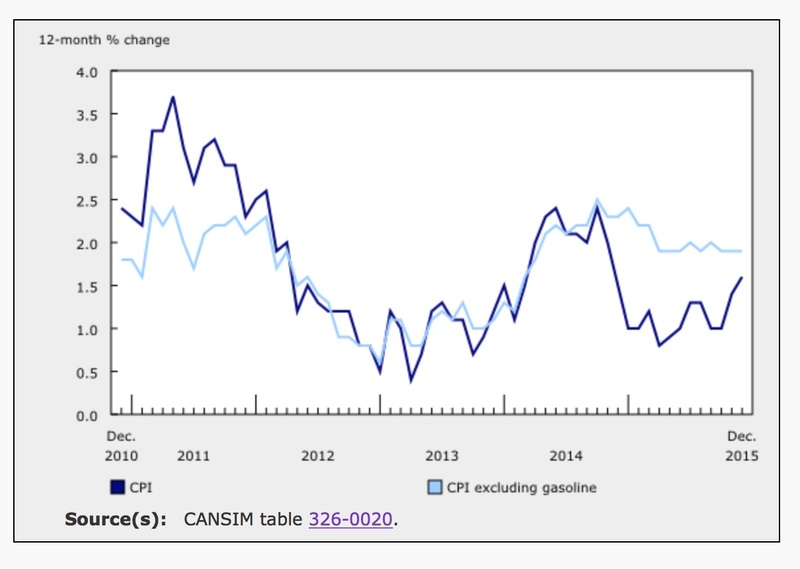 Cheap oil and economic slack are are creating disinflationary pressures while the low Canadian dollar drives inflation higher as imports become more expensive. In a recent statement to the press, Governor Poloz discussed the slowdown in the Canadian economy in the fourth quarter of 2015. The Bank of Canada will make their next interest rate announcement on March 9th and will likely cut rates to keep the economy moving towards full growth.